Dental bonding can be used as a restorative procedure for teeth that are chipped, cracked, discolored or misaligned, and can even be an alternative to porcelain veneers. Dental bonding is a procedure in which a tooth-colored resin material (a durable plastic material) is applied and hardened with a laser, which ultimately bonds the material to the tooth to restore or improve person's smile. 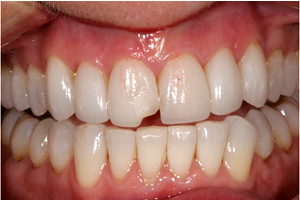 This patient suffered a chipped front tooth as a result of a traumatic accident. 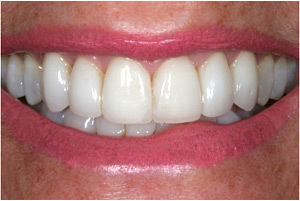 With dental bonding, the patient’s smile was restored to its natural beauty. Little advance preparation is needed for dental bonding. Anesthesia is often not necessary unless the bonding is being used to fill a decayed tooth. Your dentist will use a shade guide to select a composite resin color that will closely match the color of your tooth. Next, the surface of the tooth will be lightly etched and a conditioning liquid will be applied, which will help the bonding material adhere to the tooth. The tooth-colored resin is then applied and sculpted to the desired shape. A curing light is then used to harden the material. After the material is hardened, the dentist will further trim, smooth and polish it to a natural appearance. Dental bonding is among the easiest and least expensive of cosmetic dental procedures. The bonding procedure can often be completed in a single office visit and can improve the appearance of a tooth significantly.